The Commission on the Status of Women is currently taking place at the United Nations Headquarters in New York from 13 to 24 March 2017. The Commission has identified the empowerment of indigenous women as the emerging issue/focus area for its 61st Session in 2017 on the occasion of the 10th anniversary of the UN Declaration on the Rights of Indigenous Peoples, responding to indigenous women’s concerns, reflected in recommendations of the Permanent Forum on Indigenous Issues (2015) and the outcome document of the 2014 World Conference on Indigenous Peoples. The three-hour meeting on the emerging issue/ focus area “The empowerment of indigenous women” took place on Thursday, 16 March 2017 (10 am. – 1 pm.) with 9 officials speakers as well as 19 Member States and several indigenous peoples’ organisations taking the floor. 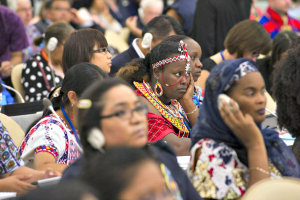 In follow up, the Permanent Forum in its 14th session (2015) was more precise in recommending a specific year to ensure that “empowerment of indigenous women” would be considered by the CSW, by recommending that: “the Commission on the Status of Women consider the empowerment of indigenous women as a priority theme of its sixty-first session, in 2017, on the occasion of the tenth anniversary of the adoption of the United Nations Declaration” (paragraph 43 in E/2015/43). As a result of the Forum’s recommendation and concerted efforts by its Secretariat and indigenous women’s organizations, several actions took place in 2016 and in particular during the 60th Session of the CSW to follow up on the recommendations. This included briefings for the Chair of the Bureau of CSW, the Group of Friends of Indigenous Peoples as well as by organising side events during the 60th Session of CSW. The Commission finally decided in resolution E/RES/2016/3 on its multi-year programme of work to include a preambular paragraph, “Recalling the invitation to the Commission on the Status of Women to consider the issue of the empowerment of indigenous women at a future session, as stated in paragraph 19 of General Assembly resolution 69/2 of 22 September 2014, and acknowledging the intention to place this issue as a focus area of its sixty-first session”. At its 60th session in March 2016, CSW then decided to consider the empowerment of indigenous women as a focus area/emerging issue during its 61st session in 2017. The CSW proposed programme of work (E/CN.6/2017/1/Add.1) for the 61st session includes “Empowerment of Indigenous Women” as a focus area/emerging issue. The session will furthermore be covered as a half-day session in the high-level week of CSW. Members of the Forum and the Special Rapporteur on the rights of indigenous peoples are invites as well as indigenous women.